(CNN) -- Was it a theft? A prank? A roundabout effort to bring some holiday cheer to the police? Authorities in Harwich, Massachusetts, are probing the mysterious appearance of a piano, in good working condition, in the middle of the woods. 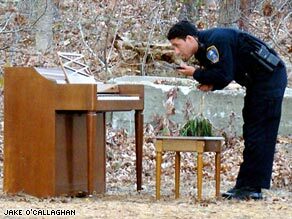 Officer Derek Dutra of the Harwich Police Department examines the mystery piano in the Massachusetts woods. Discovered by a woman who was walking a trail, the Baldwin Acrosonic piano, model number 987, is intact -- and, apparently, in tune. Also of note: Near the mystery piano -- serial number 733746 -- was a bench, positioned as though someone was about to play. Asked whether Harwich police will be holding a holiday party in the storage bay -- tickling the ivories, pouring eggnog -- while they await word of the piano's origin and fate, Hutton laughed. No such plans. Harwich police have had some fun, though. Among the photos they sent to the news media is one of Officer Derek Dutra examining the piano in the woods. The police entitled the photo "Liberace." CNN's Justin Lear contributed to this report.